Steps of how to transfer FormZ file to the viewer? Silly question. Is there a guide or steps showing how to transfer files to the viewer thru 1) air drop, 2) google drive, 3) itune? Have you checked out the links at the bottom of this page for More Info and Video? Yes, we still have some troubles. We uploaded to google drive (just the form Z file) and saw it on the list, but it was greyed out. I will try the airdrop later. ok I got the FormZ file into the app thru Airdrop. But how do I bring in texture maps? I tries zip, that didnt work. Do I need to drag and drop all the maps? You don't need to include the texture file, but you do need to embed them in the file (which is the default). To do this, open the project, go to the File Menu: Project Settings: Project Files tab and make sure that Keep Textures is checked. And for a smaller file, make sure the Texture Compression is set to JPG. Thanks ZTech. I tested it again, the maps show up in a thumbnail view of the file in the app but once it loads they don’t show. Do you have the File Menu: Project Settings: Project Files: Keep Textures option checked? Google Drive may cause issues on some computers. Please try one of the other options if you are having difficulty with this. Also, in the FormZ File Menu: Project Settings: Project Files, make sure that the Keep Textures option is checked (and set to JPG or whatever you like), and that the File Optimization is set at 33% (closer to Opens Fast). Does that get you going with the viewer? Thank you for your answer. Unfortunately this does not solve my problem: The Google Drive is the only way, that could work, to pass over some files to discuss with my employer. I have had absolutely no problem with Google Drive so far - so I suppose, the issue is more related to your viewer. Why is there not an option for Dropbox. Why not sending by E-Mail. Email should work. Attach a file to an email account that you have access to on the device. When you get the email tap (or double tap) the attachment and it should open in the viewer. Have you tried this and it did not work for you? We have observed the problem you described with Drop Box and Google drive. Neither are recognizing the form•Z file extension (.fmz). We have logged an issue with Apple as the OS manages the connection of files between apps. We know we are notifying the OS properly that we can open .fmz files as Apple mail, iCloud and Airdrop all work. It seems to be an issue with non-Apple services. Hopefully we can get this resolved soon. Yesterday an Ipad Air2 arrived which I've purchased primarily for this app, otherwise I would have got an Android. Unfortunately, I can't view my FZ files with it. Hopefully there will be a way. The closest I've got is attaching an FZ model by gmail from my windows 7 pc, I am using the Gmail app on the IPad. I long press or double click on the attachment, but all I see is the file name and the words FormZ Project File and file size in the middle of a slightly darkened screen. Does it only work if it was saved from an Apple computer? Is there a converter if that is so? There should not be any issues with files created on a PC. 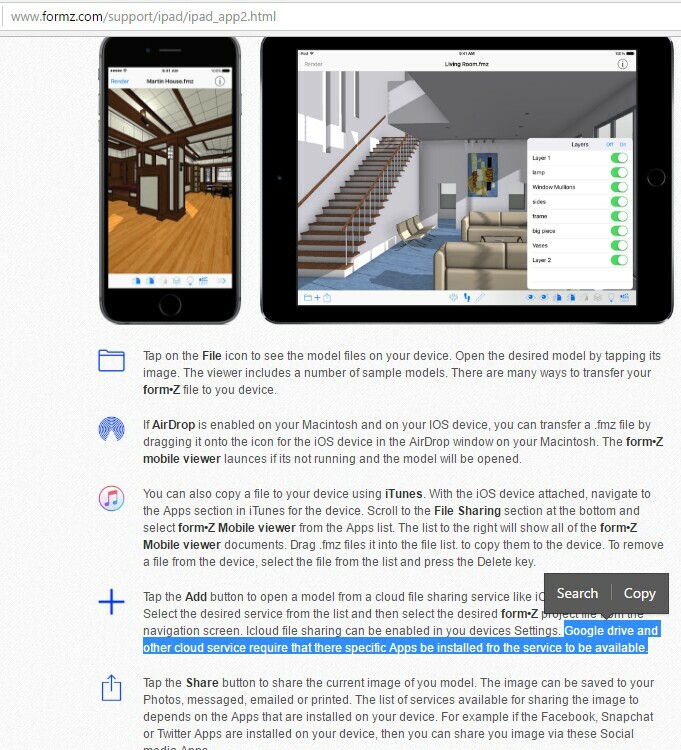 If you save the file to the iPad and try to open it with the viewer, does that help? As I mentioned in another thread, I was successful by accessing the file in dropbox, and selecting 'export' which brought up options of where to export it to, I chose FormZ Viewer App and hey presto, it opened it. I just installed it and it seems to work great so far. As for how to get the files "in" (and we have an iPad pro that multiple users share) without all the apple-cloud-id hassle we just created a download link from webserver and then the files open directly from safari into the FZ mobile folder - that worked really well. Since doing that, I am now able to email FZ files to myself, (which is working fine now from gmail to gmail without zipping first) and the formZ viewer is an option offered by airdrop. I think the export method may have been required first of all to get the IPad to recognise the FZ viewer app's association to the file type. Textures stoped showing up in the mobile viewer. I have checked "Keep Textures" and set file optimization to 33% under Project Settings but it still doesn't work. Created a test file with only a cube and a texture from the default library with no luck. Funny thing is it was working fine a few weeks ago! Older files still have their textures. To be clear, if you if you load older files into the Viewer it is working properly, but if you create a new file then the textures are not showing up, correct?